S49076 is an effective inhibitor of MET, AXL/MER, and FGFR1/2/3. S49076 potently blocked cellular phosphorylation of MET, AXL, and FGFRs and inhibited downstream signaling in vitro and in vivo. SAR125844 is a potent and highly selective c-Met inhibitor with potential antineoplastic activity. BMS-817378 is a potent ATP competitive inhibitor of Met/VEGFR2 with IC50: 1.7 nM/15 nM for Met/VEGFR2. Ensartinib, also known as X-396, is a potent and dual ALK/MET inhibitor with IC50s of <0.4 nM and 0.74 nM, respectively. 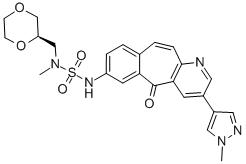 Sitravatinib (MGCD516，MG-516) is a novel small molecule inhibitor targeting multiple RTKs involved in driving sarcoma cell growth, including c-Kit, PDGFRβ, PDGFRα, c-Met, and Axl. Ensartinib, also known as X-396, is an orally available small molecule inhibitor of the receptor tyrosine kinase anaplastic lymphoma kinase (ALK) with potential antineoplastic activity. 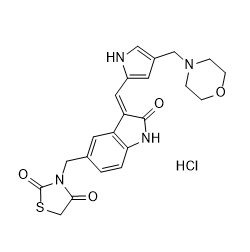 AMG-208 (AMG 208, AMG208) is a potent small molecular c-Met inhibitor with an IC50 of 9.3 nM. MK-2461 is a novel ATP-competitive multitargeted inhibitor of activated c-Met with a mean IC50 of 2.5 nM. BMS 794833 is a potent ATP competitive inhibitor of Met (IC50 = 1.7 nM) and Flk-1 (IC50 = 15 nM).